1) Choose a size that is smaller than you expect. This garment was created to be oversized. We are yet to see an"oversized" one that someone wears and loves to wear. We actually made the children's large and it definitely fits Erika and Caitlin in a comfortable way. 2) While meeting the stitch and row gauge is important, so also is using a yarn that is somewhat lofty. We used Alafoss Lopi which is extremely warm, bristly and most important light in weight. Lets face it, this is not a t-shirt so you will be wearing it with something underneath it. 3) If you have specific buttons in mind, plan ahead and alter the buttonhole size accordingly. The directions that are given for the buttonholes are small and really will only fit a long toggle or a structured button that is much smaller than the size of the garment. 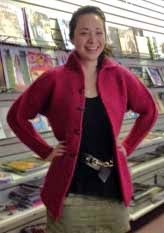 4)The only seaming that you need to do is the top seam of the sleeves. Consider crocheting that seam so that the seam will act as garment detailing. 5) When choosing your buttons, purchase inconspicuous backer buttons at the same time. Backer buttons will keep your knit fabric stable and prevent the stretching of the knit fabric as buttons are used. What the heck am I talking about? 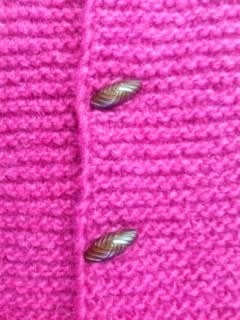 The next blog posting will focus on "how to sew buttons on knitted fabrics correctly". What should I do with a Tosh Unicorn Tail? There we are, the question customers ask when they handle those cute little Tosh Tails. Honestly, they are hard to resist....the teeny little hanks with 20 different eye grabbing colors all lined up (did I mention we put them right next to the register; kinda like candy at the grocery store). What are people doing with these? I think they need to create a Dull Roar Amazing Technicolorish Scarf. Now unfortunately, she does not have a pattern written up that I can find, but you get the idea don't you? Just stripe out all of those lovely Unicorn Tail colors. Think of all the gratification that comes with owning alllll of those colors and being able to use them without thinking too hard! 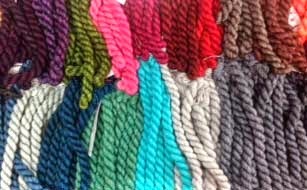 I'm not sure we even have to shape it, what about two rows of one color, then the next and tie the cool little macrame fringe as you go. I'll be back soon with that all written up for you! 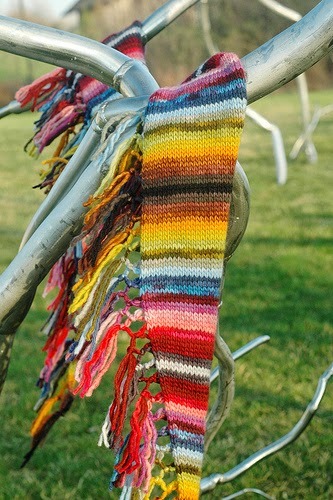 Check out what Frenchyknits thinks should be done with these colors. Crocheters, you have a new advocate in the fiber world. Frenchy is getting a little daring and might have to change her blogging title!